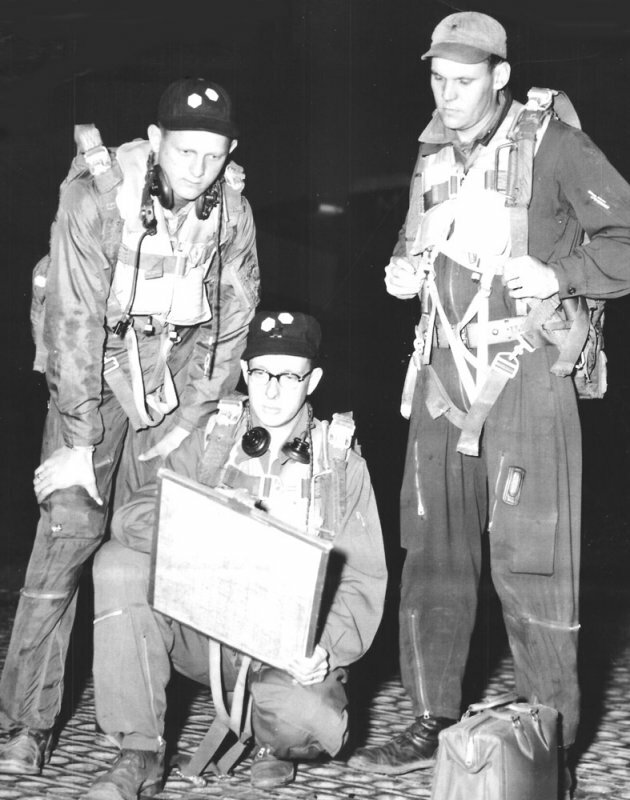 "On the night of June 13, 1952, I was flying a combat mission out of Kunsan Air Base in South Korea where my A-26 squadron, the 90th of the 3rd Bomb Wing, was stationed. My navigator, Captain Bill Sanders rode in a jump seat to my right in the cockpit. 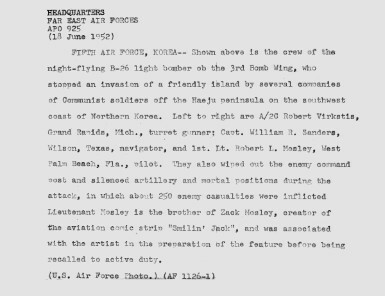 Sergeant Bob Verkstis was at his gunner's position in the rear of the A-26 manning two .50 caliber machine guns defending our Six o'clock. It was about 2 AM and we were just south of Pyongyang North Korea when we received garbled transmissions from a ground station. Since the station was unreadable we continued north toward our target in the northeast corner of North Korea. I was more attentive to the coming bombing and strafing procedures to be used in the enemy area outside our normal targeting territory than worrying about garbled radio receptions. When north of Pyongyang the radio came up loud and clear directing us to divert from our assigned mission and proceed ASAP to the southwest coast of North Korea. We immediately turned back to the south. The station gave us the radio frequency for contact, target information and location of friendly forces. Upon making radio contact approaching the coast, we were told that a small, friendly held island just off the west coast of Korea was being invaded by a large enemy force crossing from the mainland over the mud flats at low tide. They further advised that a flare ship was available and would light up the mud flats. "I was flying an early model of A-26 'hardnose' which had the usual six 50s in the wings but only six in the nose instead of the normal eight which gave us 12 instead of 14 forward firing 50s. When overhead the target, we were cleared to attack. Tracers, explosions and flak seemed to fill the air as we rolled in under the flares in our first firing run on the enemy crossing to the island. As we pulled off that first run and turned left to start another strafing run, the friendly forces radioed that we were right on target and to 'Keep it up!' We made nine runs before all our HEI bombs and our .50 caliber ammo was expended. We reported ammo nil and proceeded toward Kunsan. As we departed the target area, the friendly ground station was elated and expressed their gratitude for our saving them from being overrun. They were not going to be wounded, killed or taken prisoner that night. After landing at Kunsan and being debriefed we were told that our attacks had knocked out the enemy's command post, artillery and mortar positions and had completely destroyed the invasion attempt. Friendly ground forces counted approximately 250 dead North Korean communists out of an invading force of an estimated 500 troops. The Far East Air Forces reported the KBA as a record for a single sortie. The report of our highly successful mission caused quite a stir. 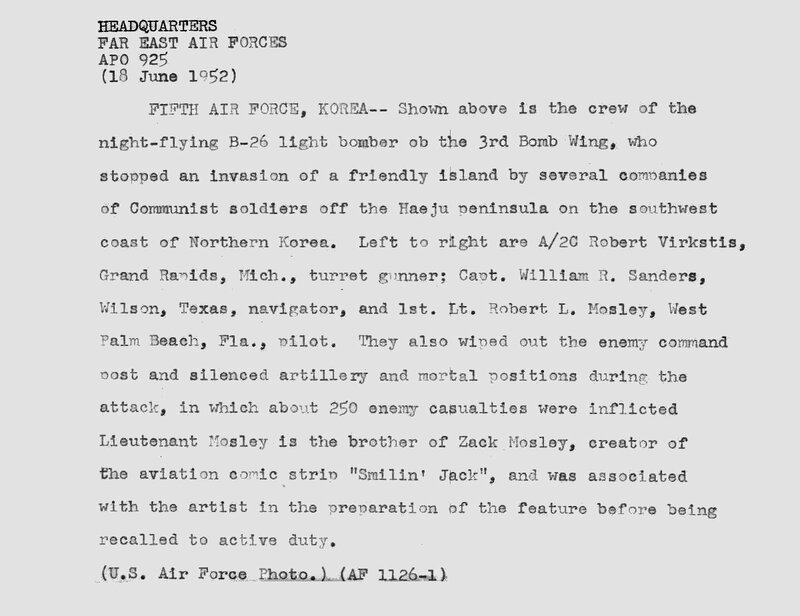 After further confirmation of the results, the Air Wing sent the entire crew of my A-26 to Headquarters Far East Air Forces in Tokyo, Japan where we met the press and were given wide coverage in American newspapers."